Scott Adam Rice was born on September 21st, 1981 in Simi Valley California. The tall six foot six left hinder was signed after high school by the Baltimore Orioles as a 14th round pick in 1999. Rice spent 14 seasons in the minor leagues before getting his big league call up. He pitched in the Rookie League his first three seasons as a starting pitcher. He then went to A ball through 2003, where he was converted to a reliever. Prior to that he had a horrid seasons going 1-13 overall in 2002. He spent eight years in the Orioles organization before signing with the Texas Rangers in 2006. He spent four years there seeing limited action due to injuries on his flexor tendon. 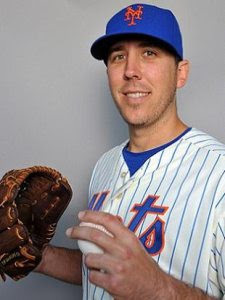 He then pitched as a middle reliever in the New York area in the Independent League, with the Long Island Ducks (2008) & Newark Bears (2009). He then got signed by the Colorado Rockies in 2010 but was granted free agency at the end of the seasons. In November 2010 he signed with the Chicago Cubs but was released at Spring Training. He was given a quick look by the L.A. Dodgers in Spring Training of 2011 but that didn't work out either. 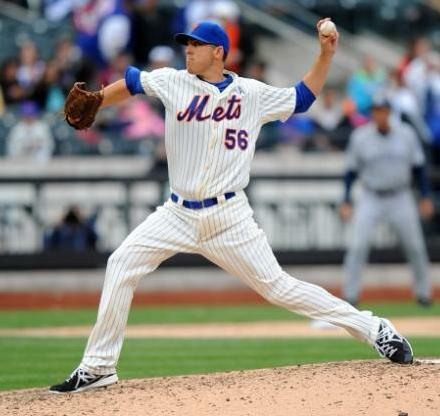 In November of 2012 he was signed by the New York Mets & was invited to Spring Training '13. Rice had a solid Spring & after 14 seasons & 480 minor league appearances he made his first big league roster spot. The 31 year old Rice was thrilled, he never gave up & his dream finally came through. He debuted on Opening Day finishing up the 11-2 win over the San Diego Padres, notching two strike outs. He saved the game ball & in the locker room, said he was giving it to his dad, who was in attendance that day. Also on hand were; his wife, sister, bother in law & a long time friend. He told the Daily News: " “They usually come out a couple of times a year. I think this year they’ll probably come out a few more times just because we’ll be going to better cities than Albuquerque and Des Moines, Iowa." On April 7th he earned his first career win, as a Marlon Byrd walk off single gave the Mets a 4-3 win Over the Miami Marlins. He began to see more & more action as Terry Collins used him as his late inning go to guy. In May he suffered back to back losses, allowing late inning winning runs, in games against the Pittsburg Pirates (at home) & the St. Louis Cardinals (at Busch Stadium). On May 19th he pitched two scoreless innings against the Chicago Cubs which earned him his second win. 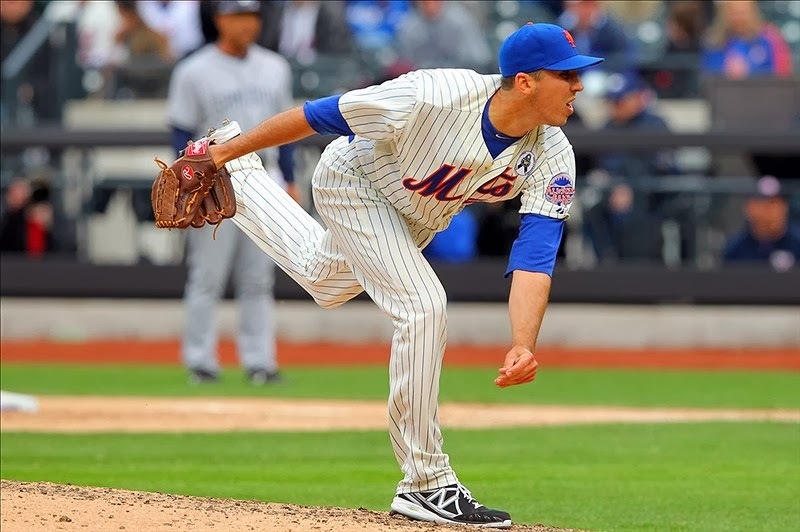 He earned his third win of the year in the subway series on May 28th, after pitching a scoreless 9th in relief of Matt Harvey & behind 1-0. The Mets notched three straight hits off Mariano Rivera including RBI singles by David Wright & a walk off by Lucas Duda. The next day he pitched a 0.2 scoreless 8th inning & was credited with his fifth hold of the year. 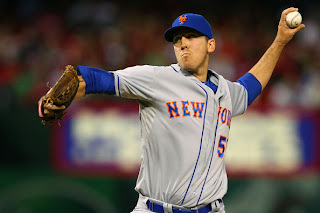 In the Fourth of July 15 inning game at Citi Field, Rice was the losing pitcher, giving up three straight singles to the Arizona Diamondbacks. But five days later on the same road trip he earned a win at San Francisco, as the Mets swept three from the Giants. By the All Star break he already had made 49 appearances & was on pace to appear in over 100 games. Mets broadcaster said of his frequent appearances call him "Scott every Minute Rice". In August he earned six more holds, adding another in early September, giving him 17 on the year to go along with his 4-5 record & 3.71 ERA. In early September he was leading the league in appearances with 73. He had 41 strike outs & 27 walks in 51 innings of work. His season came to an abrupt end, when he needed hernia surgery, making his last appearance on September 3rd. 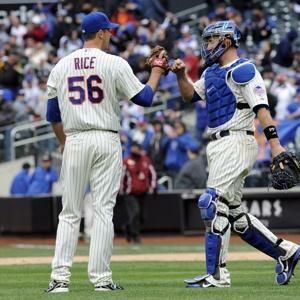 Rice began 2014 with Mets, on Opening Day he blew a 4-2 Mets 7th inning lead walking in the tying run. 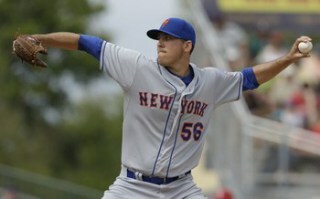 In his next outing he gave up two more runs, ballooning his ERA to 54.00 & he was not able to get it down all season. He was credited with four holds the rest of the month but then took a loss as well as a blown save (his second). On June 3rd, he gave up a walk off single to Nate Schierholtz of the Cubs, at Wrigley Field, taking his second loss of the year. He had struggled most of the year, his ERA was at 5.93 & he was sent down to AAA Las Vegas. In his two year career, he is 5-7 with a 4.18 ERA, 54 strike outs & 39 walks in 64.2 innings in 105 appearances.